With the new feature AmbientLIFX introduced in version 0.4, I want to inform you how it works, and what the settings do. AmbientLIFX basically makes a screenshot of your main monitor. It then calculates the mean color and brightness of that screenshot. All of your bulbs with AmbientLIFX enabled will be set to that color and brightness. You can configure how many times per second AmbientLIFX should make a screenshot. Recomended maximum is about 30. You can go higher, but it won't have much effect. This is basically the same as the "Time" parameter when you control the lights (while using "set Color" and "Instant Change" disabled). If you set it to 0, your lights will instantly change the color as soon as they receive the command, the higher you set "Smoothness" the longer the transition between the current color and the new color will be. Rate will limit the change your bulbs do each time a new color is set. This reduces the "flicker" that can occur if your screen changes from one strong color to another. Small changes can still happen instantly, but large changes in color will be split up to multiple commands. These are highly related. The thing with screen capture is, when you watch a movie, the average of the colors on your screen will be pretty much grey, with only a slight tone. The same with the Luminance: It might average to 50% or less most of the time. 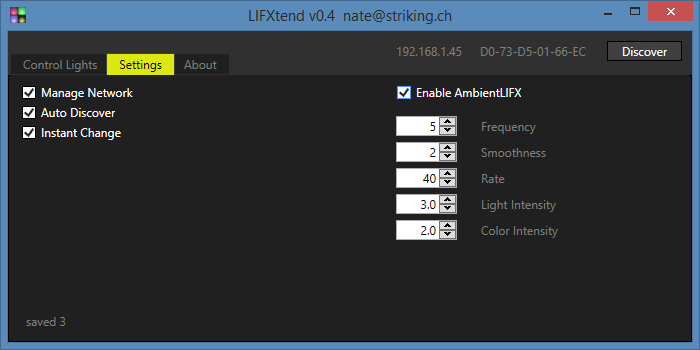 These two settings will exagerate the Luminance and the Color exponentialy. You can try and set them to 1 each, then your bulb will display the real average of your screen. If you go lower, for example with the color, it will get mostly white. There is some lag sadly, and this has only to do with the LIFX bulbs. A new firmware might improve that. Full screen games are not supported, and while that is a feature I am looking forward to myself, it will take some time - the research I have done so far makes it seem quite hard to do.